I saw this photo on Flickr and thought it was a great example of why I so often I've encourage new photographers to go out and seek others' work to get inspiration as well as to develop their own eye for what makes a photo good. This photo caught my eye because it shows a side of the world and a culture I'm not familiar with. I like the warm tones, the repeating color that the women are wearing, the unusual building (that I thought was just the facade of some ruins at first), and the storm cloud looming overhead. There's a clash between the warm feeling and the impending storm that intrigues me. 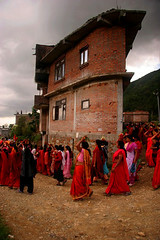 And the description of the photo says that this is an annual event and the women are all carrying flowers in pots on their heads. This adds another layer of mystery to the photo -why? I find mystery in a photo helps hold the viewer's attention -they linger on it longer pondering those "whys". So, what kinds of events happen where you live that may be considered strange by the people in THIS photo? -I'm using this photo to look at my everyday life as an outsider and attempting to put myself in the shoes of a tourist as a venture into the world this weekend. Perhaps I'll be inspired to photograph something usual in an unusual way. Why learn about aperture and shutter speed?